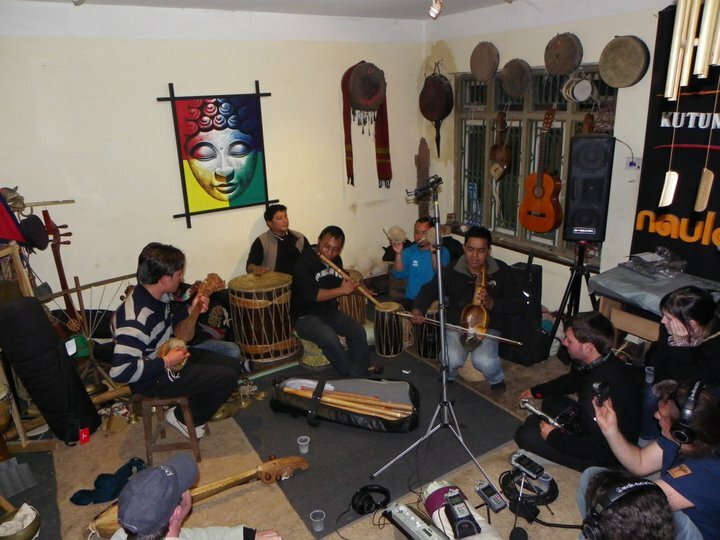 It’s the night of December 21st, 2010 and I’m sitting in a small rehearsal space owned by the Nepali folk ensemble, Kutumba. In front of me lies the ‘stage’ (read: space of carpet at the end of the room) and surrounding me are my fellow GE-OS travellers and our fearless leader, Greg Simmons. The walls are lined with various artworks and instruments, some of which I have never seen before. And scattered about the room are various amplifiers, recording devices, and friends of the band. It almost feels like I’m back in the ‘jam room’ (read: carpeted half of the garage) at my parents house in Armidale. Arun Manandhar on Tungna & Arbajo. In my left hand I wield my Schoeps M/S pair, and I set gain levels on the 702 with my right as the band tunes up and does a quick sound check. I’ve left my Manfrotto stand back at the guest house so it looks like I’m holding my rig tonight. I’m slightly right of the centre of the room, as Greg has set up an XY pair at the front of the audience and various others have scattered about Zoom recorders and such. It’s not ideal but too late to get a better spot now. 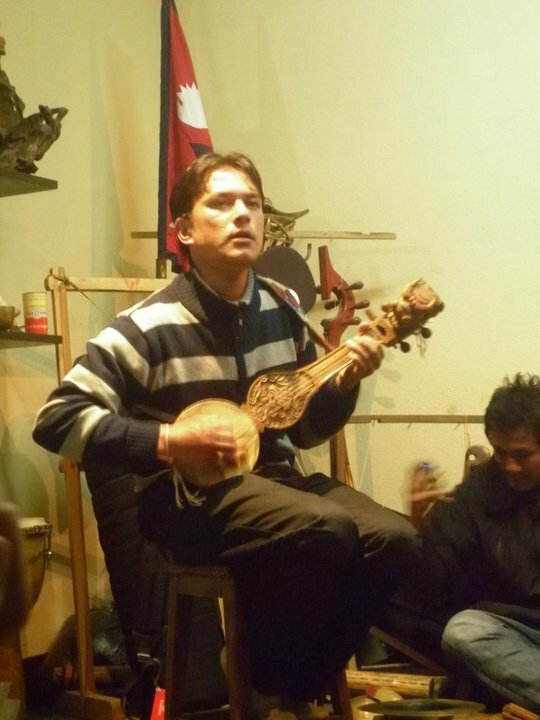 This first recording entitled, Pariwartan (meaning “change”) is a variation on the classic Nepali folk song, Resham Firiri. If you’ve ever been to Nepal, no doubt you would have heard the original being sung by one of the locals or playing in a restaurant somewhere. Here Kutumba have taken this classic and worked it into their own, experimenting and changing Nepali folk music, which is what they’re all about. Track two is called Freedom. A dark and haunting piece about the Nepalese Civil War, in which more than 15 000 people were killed over a 10 year conflict, ending in 2006. This war was a huge blow to the Nepalese tourism industry, the countries main source of foreign exchange. It ended with the signing of a Comprehensive Peace Accord which is now monitored by the UN. These days Nepal really is a land of Never Ending Peace And Love, so no need to worry if you’re thinking of heading over! In fact I would highly recommend it and hope to return myself, one day. 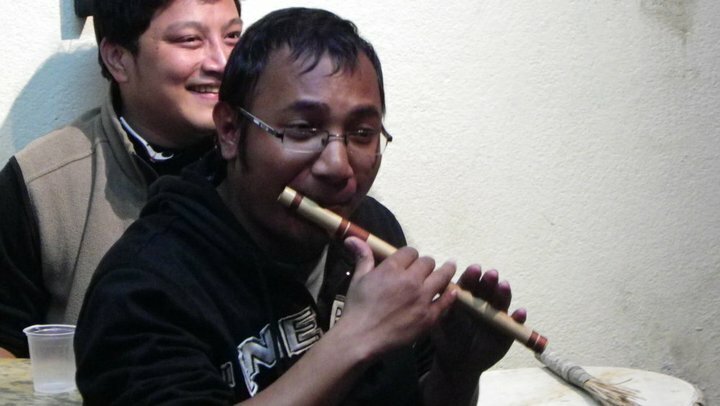 Rubin Kumar Shrestha on Flute and Pavit Maharjan on Percussion. Above we have a beautiful song about the divinity of common life and that seen in common people. It is called, Divinity. …A huge smile on my face and a sigh of sweet relief as I lower my burning arm! After the performance, the group is treated to an amazing feast of traditional Newari food with the band, including some delicious spicy buffalo tongue. We also get to indulge in a fair amount of home brewed raksi (rice whisky) which goes down a treat with a little Coke. It’s just like a good old Aussie BBQ! We chat and laugh (I rub my aching arm..) until the moon is high in the sky, before stumbling back to our guest house. It’s been a great night. Note to self: Always bring Manfrotto stand. – Thanks to all the members of Kutumba, particularly Kiran Nepali (heard above on Sarangi) who helped with the titles and meanings of the songs. – All photos courtesy of Pia Herrera and Jonathan Olegasegarem.